The alarm went off at 4:30am, though it didn't wake me. I had been lying there, trying to get back to sleep, for almost an hour. It was a futile exercise. The alarm merely formalized what my body already wanted. It was still dark outside when I got up. I wasn't tired. Curiosity was going to launch in about six hours, and I was in Florida, and would be in the bleachers at the Kennedy Space Center to witness what would be the second-most dangerous event in that mission's history. I was fortunate enough to have VIP tickets to the launch, which meant that I joined a few thousand other people in the stands next to the big Saturn V exhibit at KSC. NASA had arranged for bus transportation that left around 6 A.M. to take us to the right place. As we rode, dawn broke over the horizon. It was going to be a beautiful day. 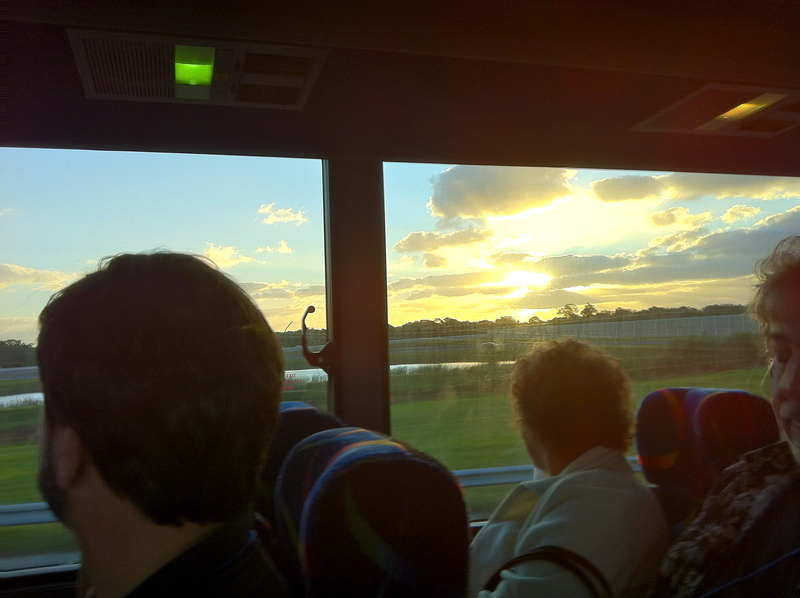 Dawn breaks over the horizon as we traveled to the Kennedy Space Center to witness Curiosity's launch. We arrived at the viewing location with about two hours to go. I spent the interim time walking slowly beneath the massive Saturn V rocket suspended in the building next to us. Outside it was warm. 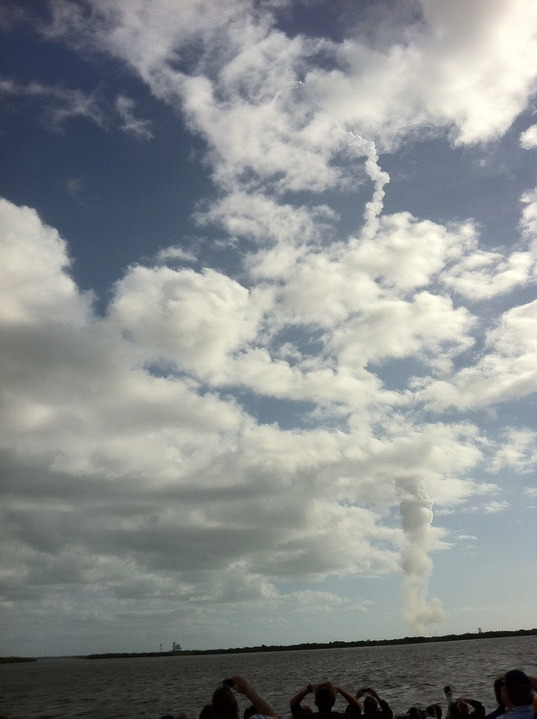 The Vehicle Assembly Building was in the distance, and the large, moist clouds of the Caribbean filled the sky. The weather continued to be favorable and I realized that the little rocket way off in the distance may actually launch today. 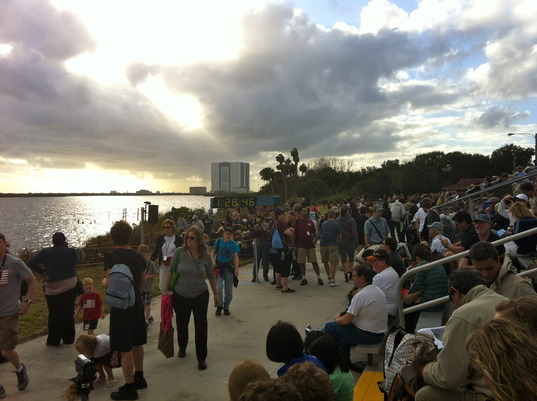 The crowd gathering before Curiosity's launch on Nov. 26th, 2011. We had a few VIPs come and address the crowd. NASA Administrator Charles Bolden spoke briefly. But all eyes were on that rocket and the large countdown clock, ticking slowly down to zero. The anxiety in the crowd was palpable. Many people around me were either involved with the mission in some way or related to someone who was. These people had spent the last five years devoting their lives to this mission, and even though the Atlas V rockets are very reliable, one never quite believes it when so much is at stake. Unlike MER, we didn't have two rovers. Curiosity's uniqueness made it vulnerable in the most frightening of ways. I remember the final minutes as a blur of activity. The audio feed from mission control was going through the final checks and countdown. The crowd tensed and grew silent as the clock ticked closer to zero. I heard a series of people reporting that they were "go" for launch, just like in the movie Apollo 13, I thought. Butterflies flew wild in my stomach. The crowd chanted out the final ten seconds of the countdown. When we reached zero there was an agonizing second where nothing seemed to happen. It was later that I realized that the initial firing of the engines were hidden by a small hill between us and the launchpad. But from our perspective, the rocket just seemed to sit there defying the clock. I remember thinking that something was wrong. It wasn't so much that Curiosity lifted off so much as that it leaped off. The staid, calm announcements and close camera angles of filmed launches had given me the impression that launches were serene, slow-motion experiences of exquisite function. But in person, the wild, barely-controlled energy exploding out of the rocket physically hits you. The sound rattles your body. The rocket seems to want to fly as fast as possible. The brightness of the flame was so intense that it would burn an impression into your vision. You have to track slightly ahead of the rocket in order to keep it from hurting your eyes. The crowd lost it. Years of work and tension and worry were released into the air and was replaced by joyous exhilaration. People were screaming. I didn't realize it at the time, but a steady stream of awe-inspired expletives were leaving my lips. Many cried. This was my first experience of a launch. 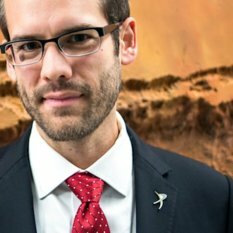 Even though I had followed space missions for almost my entire life, it was when I saw Curiosity lifted up on that Atlas V that I truly realized that we were a space-faring species. I was at a space port watching something leave the planet, never to return. I had just witnessed something that was an impossible dream when my Grandparents were born. Curiosity passed through a cloud and became too small to see. I felt emotionally exhausted. A quiet serenity took over as the crowd watched the rocket trail slowly dissipate and then returned to the NASA buses. The 3G network became clogged as everyone with a smart phone immediately pulled up NASA TV to try and watch the deployment of Curiosity into its Martian trajectory. It was one of the most thrilling experiences of my life. That night I realized that Curiosity was the last mission of its kind for the foreseeable future. No other big mission has funding or a firm start date. And after witnessing such an incredible event, I could not for the life of me understand why this had to be the case. It was, in fact, that very night that I decided to come work for the Planetary Society. I realized that the only reason missions don't happen more often is that we choose to let that be so. I decided to choose differently. The launch very literally changed my life. A mere year later and Curiosity successfully passed through its most-dangerous event of her lifetime (the landing) and is safely on the surface of Mars. The mission so far has been flawless, the pictures astounding and mysterious. The success was not an accident. It's due to the very hard work of those thousands of people at the launch that day and the thousands of others who could not make it. It's fundamentally a human success story. It represents the best of us. So here's to the first year of Curiosity's mission. The best is yet to come. 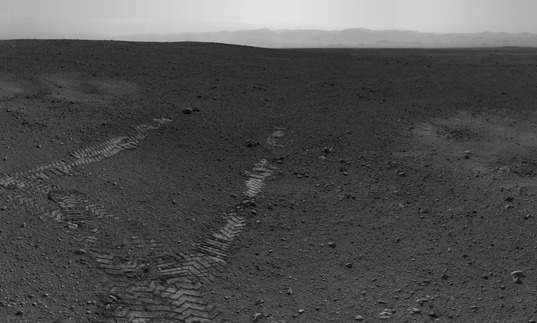 Scour marks and wheel tracks mark the spot where Curiosity first touched down on Mars on August 5, 2012. The site has now been named Bradbury Landing in honor of the writer and futurist Ray Bradbury.